Some foods simply don't get enough credit. Take these cranberries, for instance. I bought them in October. October! There've been a few casualties, a crinkled up little black berry here and there, but on the whole, I really can't believe how still-going-strong their mentality is. They simply Do. Not. Quit. I think we ought to throw them an evening ball, or maybe a roller skating party, or some sort of disco dance. At the very least, they deserve to jump into a batch of muffins. Cape Cod Cranberry Muffins, to be specific—which are from a book my parents gave me as a present last year. 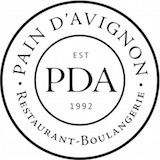 Great Coffee Cakes, Sticky Buns, Muffins & More, it's called. To tell the truth, it's not my favorite book—the instructions tend to get a little long-winded and wordy for my taste, and lots of times the recipes call for ingredients you'd never, ever have on hand. But sometimes, especially when you're looking for something just a little bit fancy, it has just the thing. And this morning was one of those times. Because on a Friday morning when your parents and sister have shown up for a visit nearly in the middle of the night and you've stayed up far too late catching up and drinking wine, you need sort of a weekend on a weekday muffin, if you know what I mean. These were just that. They're not so heavy that you feel like you just tucked away your weekend's allotment of butter, and a bit of whole-wheat flour gives them balance—throws them somewhere between indulgent and stern. They're also not too sweet. In fact, they're a bit too tart, if we're being honest, but I think that could easily be fixed by baking them with egg wash and a sprinkling of sugar over top, or even with a dollop of orange marmalade or apricot jam on the side. Because otherwise, they're very good, and just the thing to start using up some of those terribly determined cranberries. They have to go sooner or later, and at this point, I'm starting to think now would be a good time for them to politely move on. I'm guessing you have some hanging around, too, either fresh or frozen. And if you don't, Phoenix Fruit in Orleans has a whole stockpile of berries from a local bog in their freezer, so you can easily pick some up. Either way, you'll be helping to get them on their way so that we'll have plenty of room for strawberries once they arrive. I can't wait! These muffins are slightly tart, so if that's not your thing, you might want to add another 1/4 cup of sugar or so. The other option is to brush them with an egg wash and sprinkle them with sugar before you bake them, as they often do at commercial bakeries for a sweet, hard top. Or, you could serve them as we did, with a dollop or apricot jam or orange marmalade. I think the marmalade would be best. 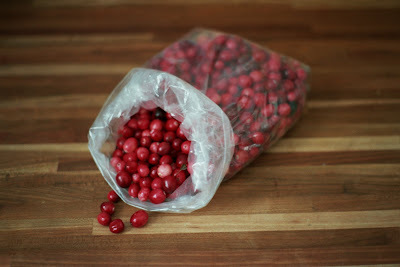 Preheat the oven to 375 degrees F. Pick over the cranberries, taking out any stems or shriveled berries. Coarsley chop the berries. (I used the food processor, pulsing a few times, for this). In a medium-size bowl, whisk together the flours, baking powder, baking soda, and salt. Melt the butter over medium heat in a small, heavy-bottomed saucepan. Remove from heat and add canola oil and sugar, mixing well. In another medium-size bowl, stir together the 2 eggs and orange juice with a wooden spoon. (I have no idea if it's important that the spoon be wooden—it seems a bit fussy to me—but Walter's directions specifically say to use one, so just in case, I think you should.) Blend in the warm sugar mixture, then add the dry ingredients and stir until just moistened. Gently fold in the cranberries. Divide the batter evenly between the 12 greased cups of a muffin tin; they should all be just about full. Brush with egg wash and sprinkle with sugar, if desired, or for a less sweet muffin, go ahead and bake them as they are. Start paying close attention to their color after 10 minutes or so; they'll probably need more like 15 or 20 before they're golden and cooked through. Walter says they freeze well, but I doubt they'll make it that far in our house. I have a crate of them in my garage attic from the bog next door.the neighbor leaves them with me and anyone in the neighborhood needs them they come here to get them. They usually make it till April or May. We keep them covered with a blanket.I have started freezing some so the dont go to waste and I will can some more cranberry sauce. That sounds like a wonderful place to store them. April or May! My bag may still make it yet. Cranberry sauce sounds like a good idea for what to do with the extra—you never know when you'll need some around. We made a beach plum-cranberry chutney a few years ago that was absolutely delicious. Thanks for this recipe, I have been having fun experimenting with cranberries this season, and I want to make muffins. I was worried that the fruit would be too tart, but I think chopping them up would help. Can't wait to try.